Summer is well on its way. We are having such a heatwave over here ! Unusual canicular days are followed by violent storms, heavy rains and coolness. Temperatures going up and down at brief intervals. Our landscape is especially luxuriant this Season, gardens and fields are grateful : flowers, cereals and vegetables abound. An orange-red rose, my favourite, with as many petals that open every day as the pages of a scented book you would read with delight. 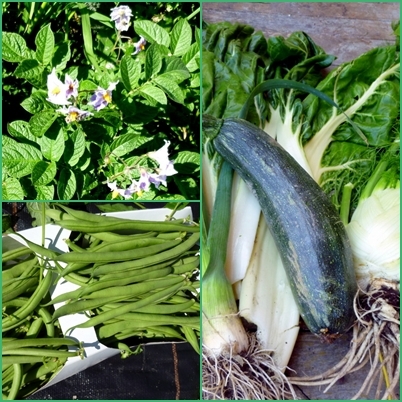 Some of our fresh vegetables picked early in the morning and served for lunch. On the menu that day for our visitors: leeks with vinaigrette, grilled zuchinis and chards au gratin with cheese. We will have to wait a few more weeks to taste our purple potatoes, something new this year. It has been a rather busy Summer with little time for blogging and visiting you, my friends, I feel sorry about this; there were several birthday celebrations, family and friends’ visits, excursions and picnics in the mountains but also quiet times along a river near our home. 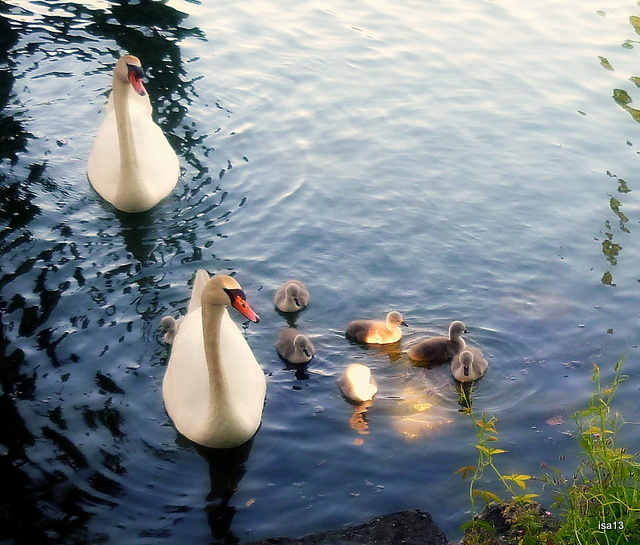 Days are longer and as the sun sets on the water, I sometimes meet a family of swans catching its rays as they glide gently towards the shore, hoping for some pieces of bread I don’t always have. Summer also brought its days of sadness and loss. Two dear friends passed unexpectedly leaving family and friends deeply shocked. The sun shone brightly though as we all gathered in a small mountain village graveyard to pay homage to both friends, at a two weeks’ interval. Sadness for the great loss. Sadness for all that remained to be shared and said. Sadness when the realization of their absence became more tangible every day. Why so soon ? Unanswered question. 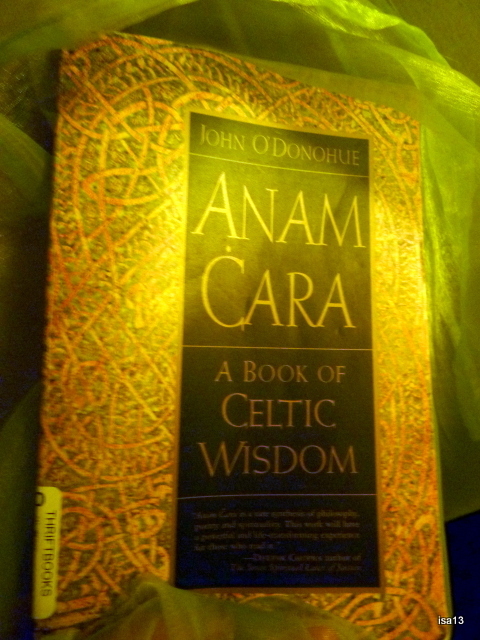 At about the same time, I began reading a book about Celtic Wisdom by the Irish writer and philosopher, John O’Donohue: “Anam Cara” or “Soul Friend” in Gaelic. Thank you to Lumens Borealis http://lumensborealis.com/about/ for having introduced me to John O’Donohue’s writings. So much gratefulness for these lines and deep reflections about death, and about much more I read in this wonderful book. Hardly a day passes without thinking of those two close friends although now sadness is mixed with the serene and happy feeling of having known them both. For R. and J.-J. I chose this Vivaldi Cello Concerto, largo. I know they loved it. Good wishes in Wolof, Mandinka and French. Alima’s papa comes from Senegal, her maman is my niece. 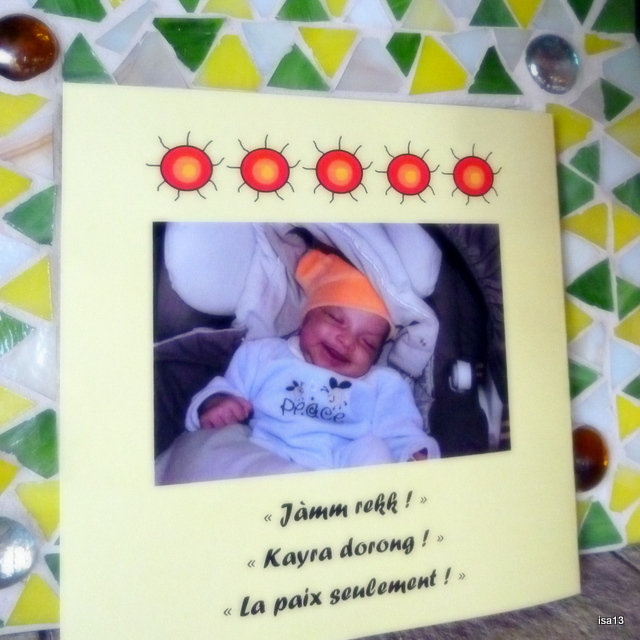 The words chosen by her parents to announce their daughter’s birth mean : “Peace only or Peace be with you”. Welcome sweet little Alima ! 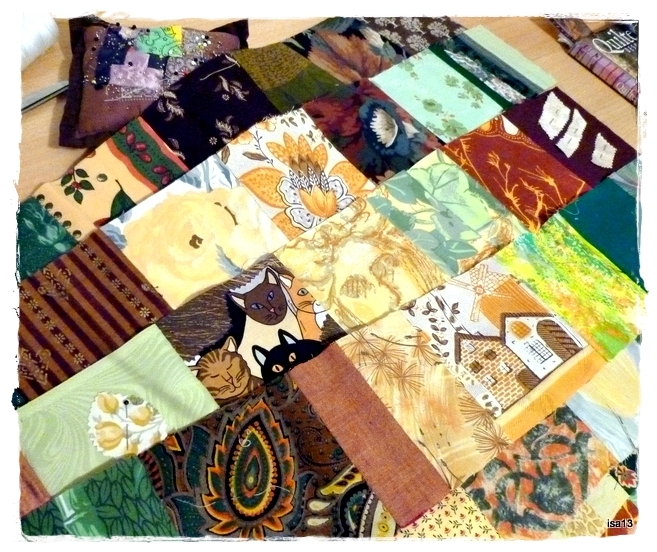 Over the past month, I have been asked if I was working on a new quilting project. Yes, indeed I was and still am. A quilt is finished and has been offered to my sister for her Birthday. Two others are in progress (WIP) ! But that is another story that I will tell you about later. Just a few shots to give you an idea. 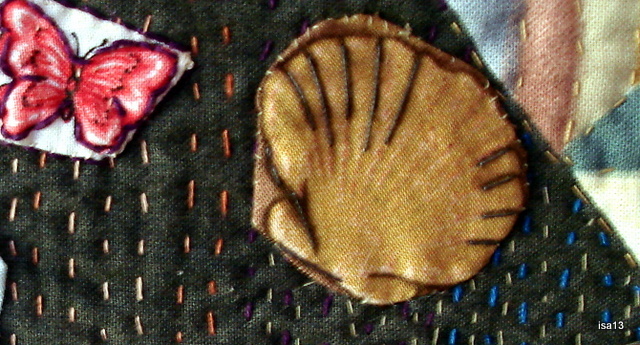 Part of my sister’s quilt sewed with so much love. 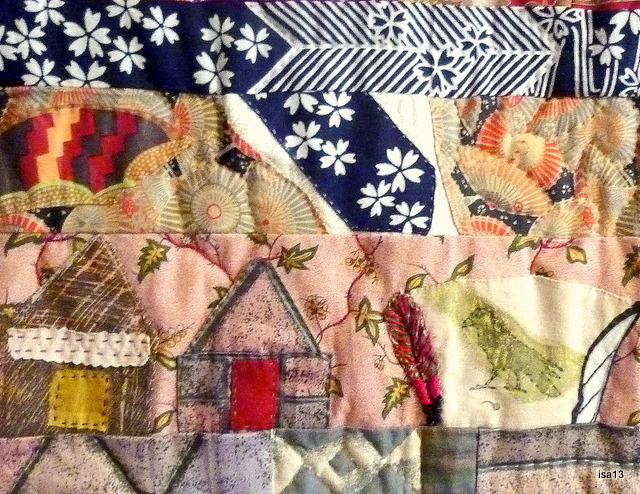 Detail of a quilt I started after the devastating tsunami in Japan. Choosing some materials for a new quilt. A small monthly quilt project. This past Summer was quite busy, in a nice and interesting way. Yet every time I could, I managed to save some time for myself in sewing and quilting. My way of getting away from the busy surroundings and concentrating on new projects… although there still are some UFO’s (UnFinished Objects) ! 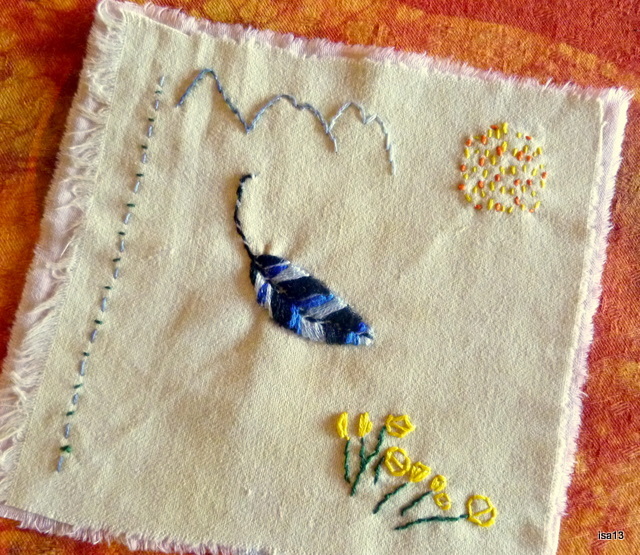 One of them was this small square of dyed cotton where I embroidered a feather for a great project initiated by Jude Hill. The fabric is dyed with a wild yellow flower called “genista tinctoria” or “Dyer’s broom”. The jay feather litterally fell in front of me one evening as I walked on a mountain track at sunset. Here are more information about this wonderful project; anyone wishing to embroider another magic feather is welcome to join. There is a description and a free instruction here too. My garden of roses is continuing to bloom, no matter the Season. Here is a lovely rose blossoming on an Indian silk. Months ago when the terrible disasters occured in Japan, tsunami, earthquake, flood and more tragedies, I kept thinking of dear friends living there. I had been given some Japanese fabrics and I decided to sew a quilt using those and others that I thought would fit in my project. Sewing for a better future, for a reconstruction of the disaster area by the resilient people of Japan. This is only a small portion of the quilt. It has to be looked at from the bottom to the top, starting by the huge devastating waves. 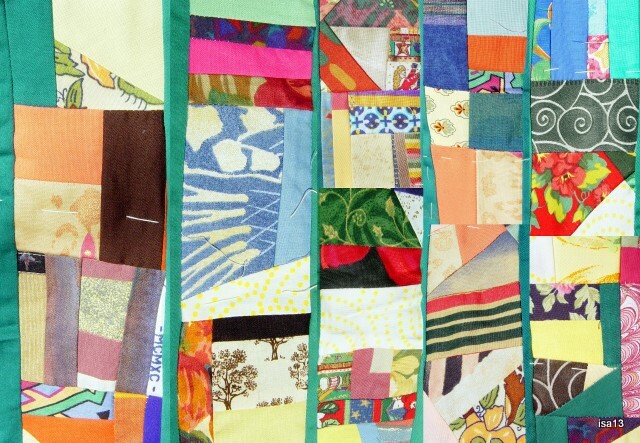 The more one looks upwards, the more hopeful, colourful the quilt will appear. From distress to hope. Also progressing, a soft lap robe for a friend who has not been well for many months. She chose the colours: brown, yellow and green. I found in my precious collection of scraps the materials and patterns that would be meaningful to her. 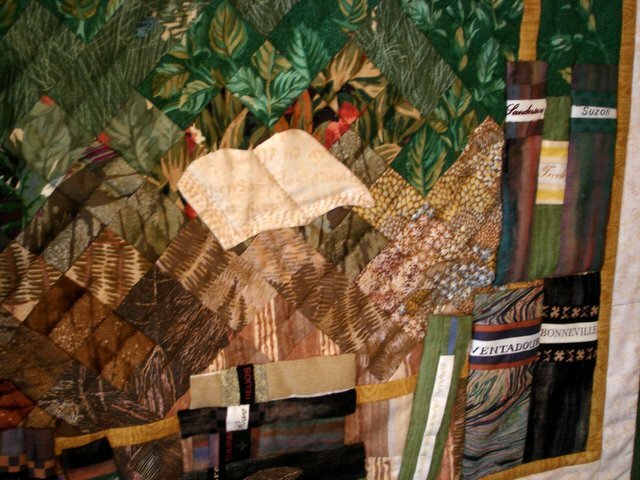 She loves reading in the garden of the home she is in at the moment and I feel she will enjoy wrapping herself in a warm friendship quilt. 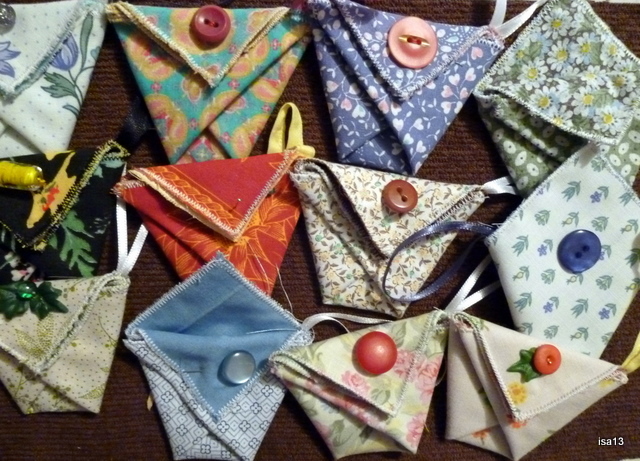 And last but not least… every member of our quilting group had to sew those small “pochettes” or pouches ? 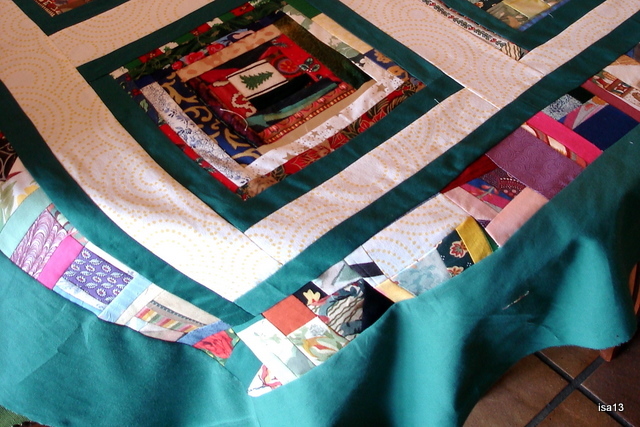 Next May there will be a large reunion of quilters in our area. We will organise this event. Each participant (about 300) will receive such a little pouch as a gift from our group. “What is it for ?”, you may ask. Ah, that is the question ! The first one who guesses its use will receive a similar “pochette”. How about that ? 😉 In fact, there could be several utilizations for this tiny pouch but we have a particular one in mind. Bonne chance, good luck ! 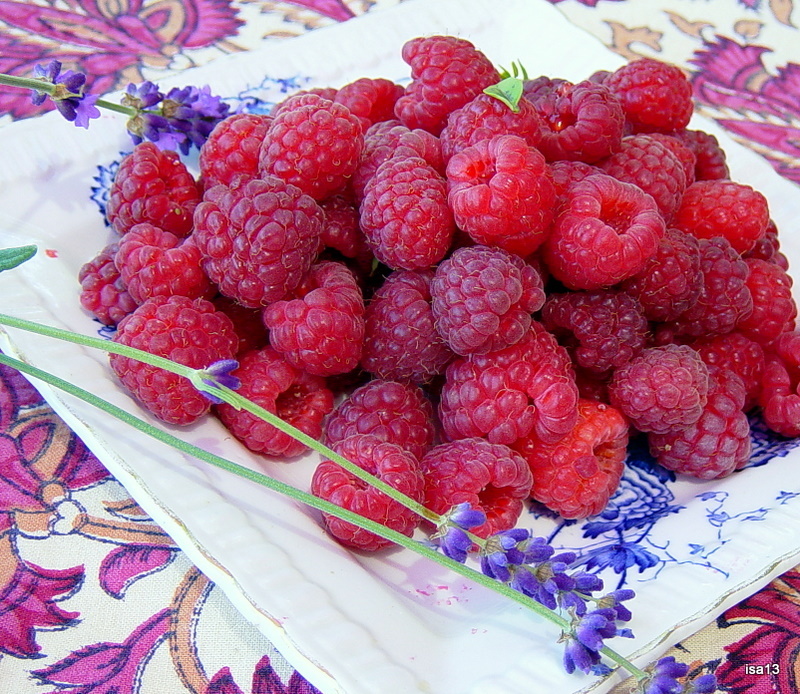 Summer is the scent and sweet taste of fresh raspberries just picked in the garden. 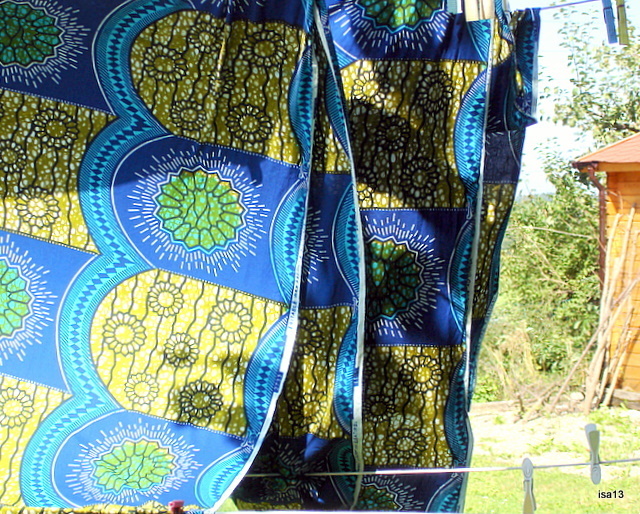 Summer is also the colourful sight and sound of laundry drying in a warm breeze. 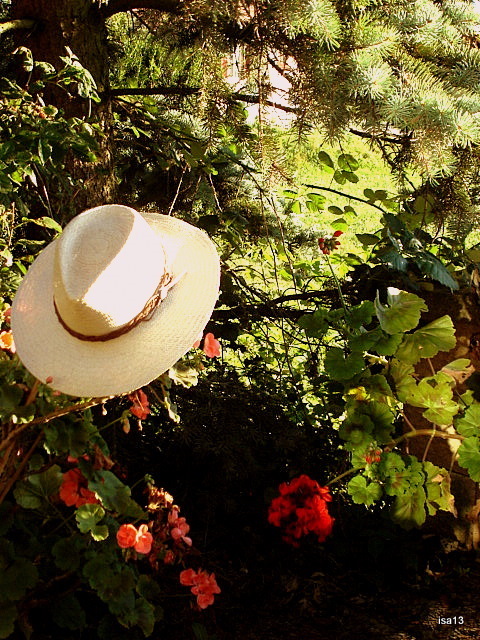 Summer is the Season when straw hats bloom under the heat. 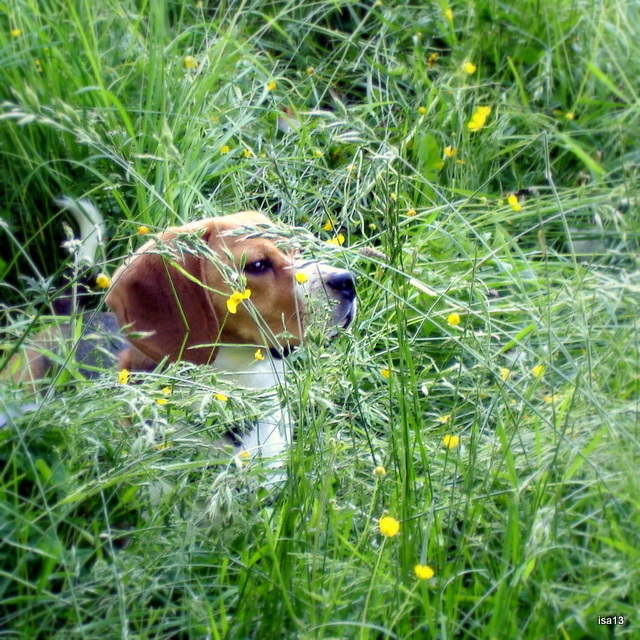 Summer is another beautiful opportunity to play “cache-cache” (hide and seek) in the meadows with your friend. Summer is a time for many celebrations. 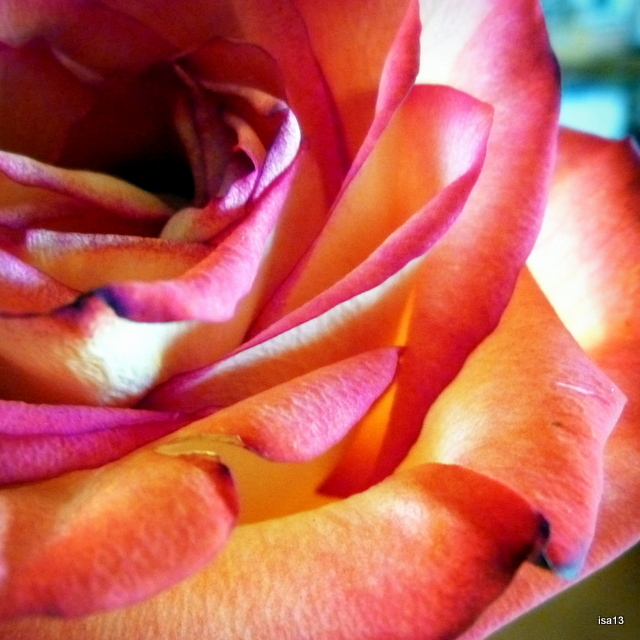 In Summer roses of all shades and shapes love to blossom. For me, Summer is also a time for living at a different pace, a slower and more relaxed one. This is not always possible, alas. 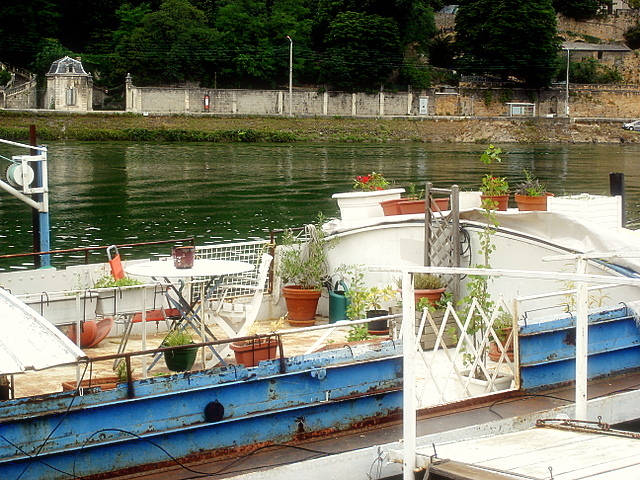 When things become too hectic around me, I remember this view and moment : an old barge anchored along a large river crossing a big French city, Lyon. Its owners had transformed it into a floating house. Its terrace looked inviting and I loved its “hanging gardens”. This is also my idea of Summertime. 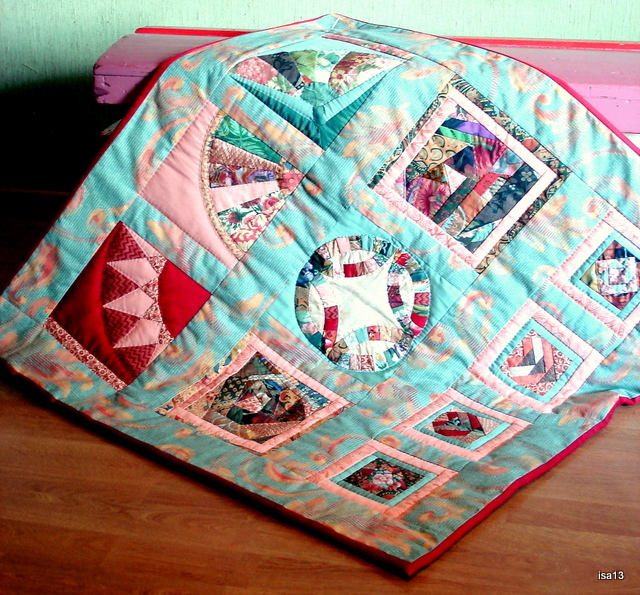 After reading Sherri Lynn Wood’s post in http://daintytime.net/2011/06/20/a-quilt-makers-memoir-of-rules/ , I thought a lot about rules or improvisation in the way I have been quilting for many years. 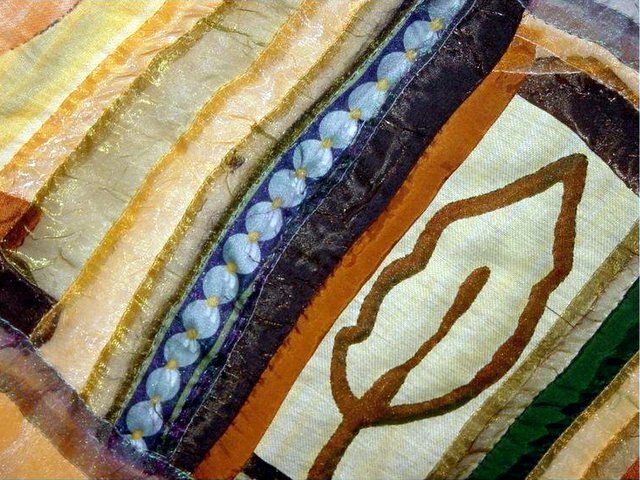 Sherri is a wonderful textile artist and a great source of inspiration. 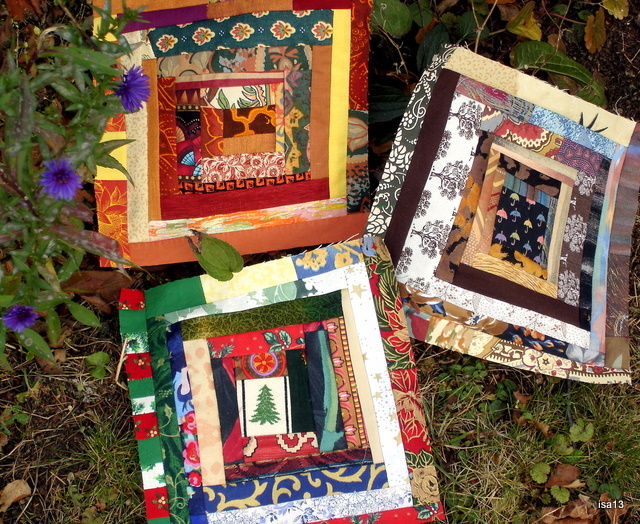 Her “Improv Mondays series” particularly is a forum where quilters can exchange their experiences and learn from one another with Sherri’s encouragement and teaching. 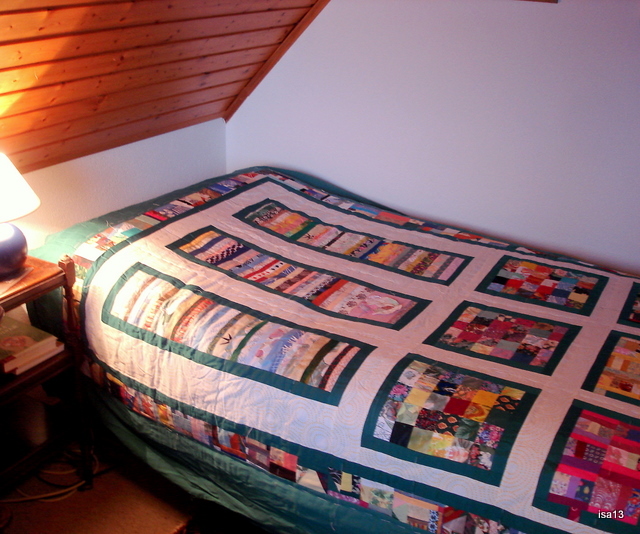 I started looking at pictures of my previous quilts and see how my own quilting has evolved over the years from rules to improvisation. 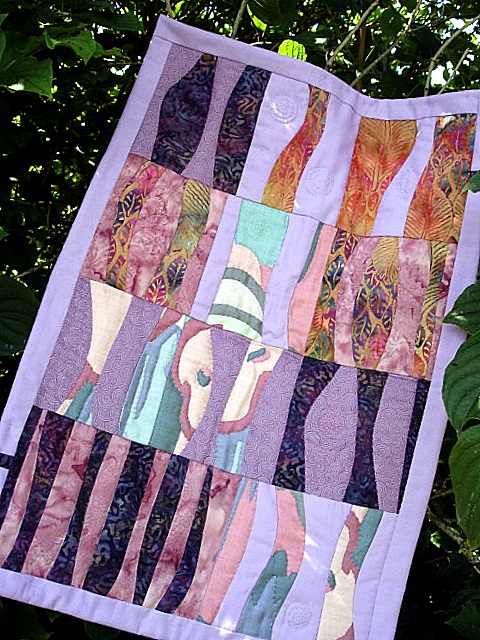 This is one of my first quilts. It is sewn and quilted by hand since I had no sewing machine yet. The materials are leftovers of curtains (silk-like) found in an interior design shop. I cut the nine-patch patterns around templates I was taught how to make. This warm blanket that has been mended countless times and I am still so happy with it. 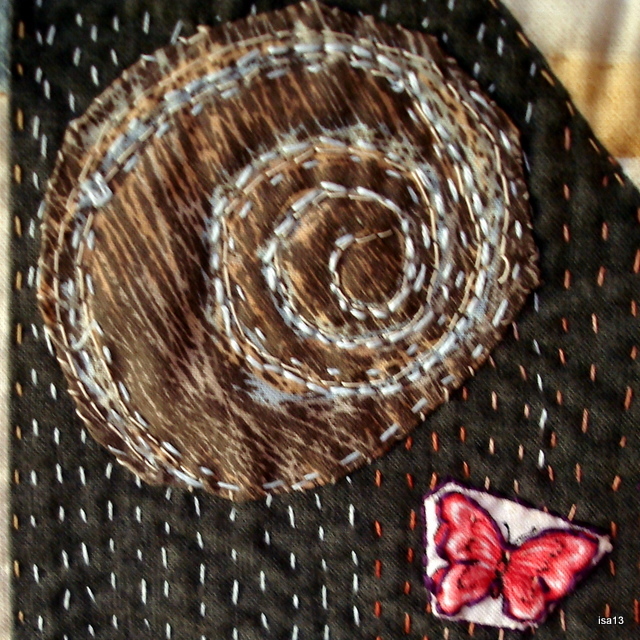 At that time I decided to name each quilt I sewed, adding a small fancy label at the back. Since I had very little knowlege about sewing, another rule was to start with easy patterns and move on slowly until I felt more or less confident with what I was doing. 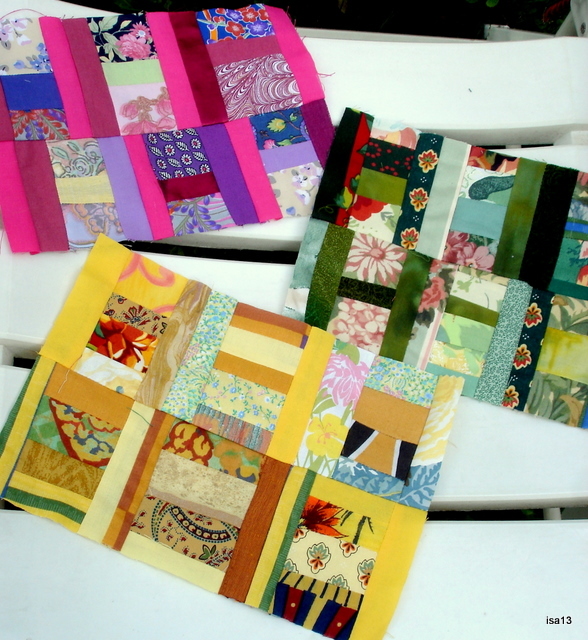 When I joined a patchwork group later, we were proposed to sew a sampler of the colours of our choice. I bought the large turquoise fabric but used only scraps for the different patterns. No improvision yet for this quilt apart from the “crazy squares”; it was fun to learn new designs and techniques, like paper piecing for instance. Later I ventured into curves. Controlled curves, mind you ! Four different shapes of curves cut with the cutter and assembled together according to colours and forms. I enjoyed this immensely for the surprise it created and the many variations. Not endless though, I knew there was more to learn and improvise about it. Another rule was : explore, try new techniques for a wider form of expression, even if it is not “perfect” according to some rules. Letting go of definite shapes and lines whenever I felt like it. One of my all time favourites is this light quilt made in a very thin and sheer material, organza. There were also leftovers given by a friend who sewed the most beautiful little handbags. I very soon realised that, wanted or not, there would be curves ! And folds and bumps and total “un-evenness” (if such a word exists in English;) The organza kept sliding under my fingers, there are few straight lines in this quilt. And guess what ? I simply loved it ! 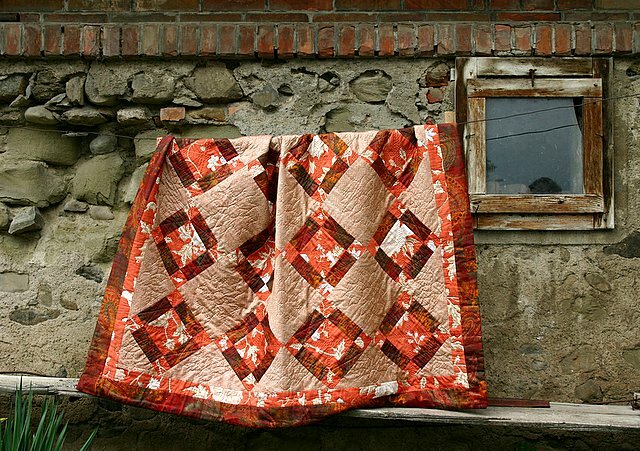 This quilt was and still is very alive, moving like a feather in its lightness and irregular folds. Another lesson I learned there : accept the fabric as it is, play with it and follow its weaving or movement while sewing. It gives more “character” to one’s quilt, I find. Just a detail to show you how transparent this organza was. 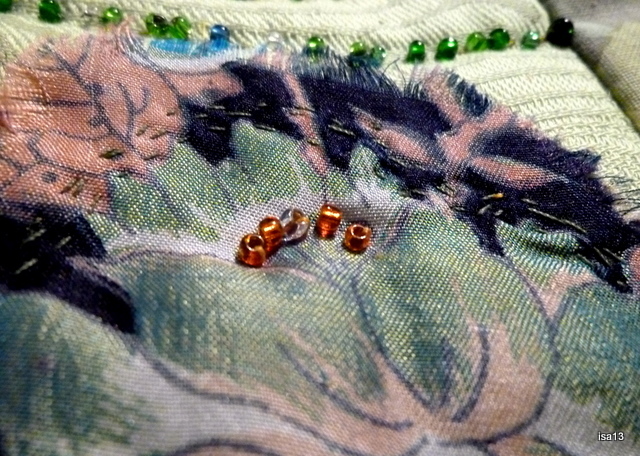 The “pearls” and the leaves are the only pieces of coton/muslin I inserted in the quilt; the pearls are covered with organza. Of course I have continued sewing with African fabrics since I came back home from a five years stay there. Improvisation came naturally, just by assembling colours and designs the way I thought they would complement one another. 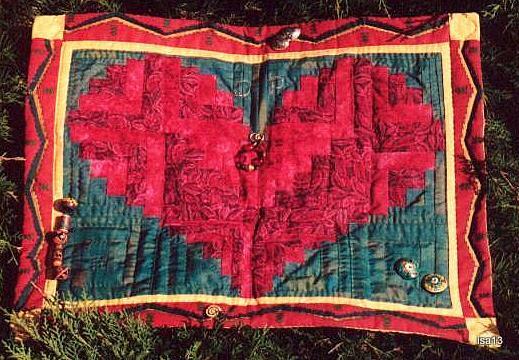 Now I am trying to improvise in creating quilts that I sew for a particular person or occasion, in memory of someone or to remember a moment, a place, anything that I want to keep alive. 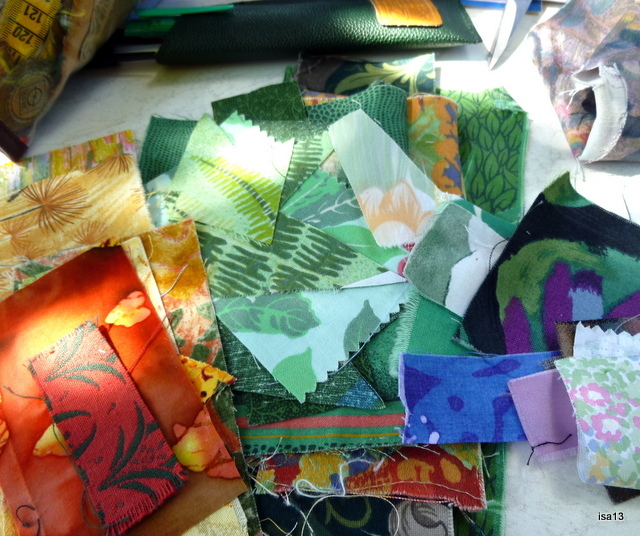 Some quilts take time and much thinking, chosing the materials and design that will best show what I feel. I started this particular quilt over a year ago. It could be a “passage quilt” although no personal materials/clothes were available. This picture shows just a part of it, the correspondance that brings sunshine when one’s life is confined. I keep adding stitches and patches here and there as I remember events. Nowadays my quilts vary. 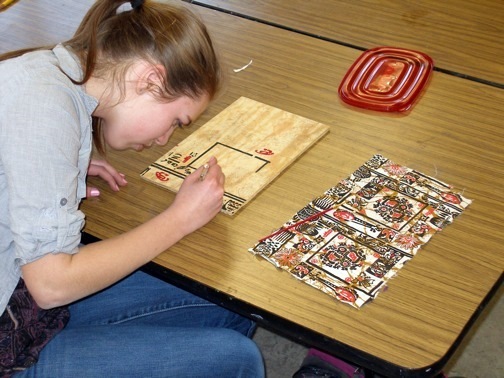 I may sew some traditional pattern like the Seminole quilt I made a while back which was a real challenge for me. I may also follow my inspiration and put together scraps or carefully chosen fabrics and try to materialize an image, a thought, a memory. A way of expressing myself. 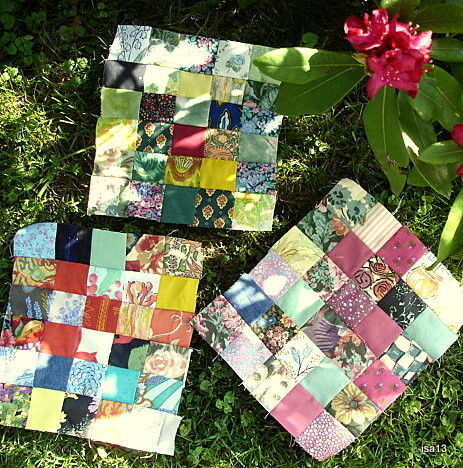 Those are the quilts I especially love. No real “rules” as such, apart from some basic techniques but a lot of improvisation as I move along with pieces of fabrics and thoughts. For the pleasure of quilting. 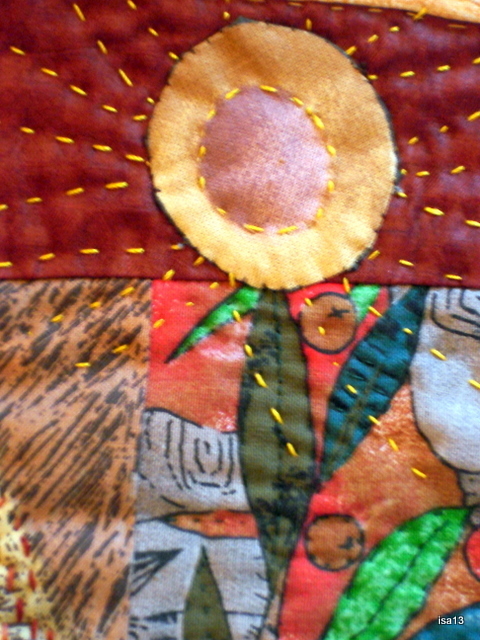 Detail of a quilt where I joined the watercolour technique – learned in a great book by Gai Perry, “Impressionist Quilts” and my improvisation. I made books with selvages of various materials. A wonderful project based on a challenge about a French philosopher and writer, Michel de Montaigne. Books and quilting, two of my favourite hobbies. 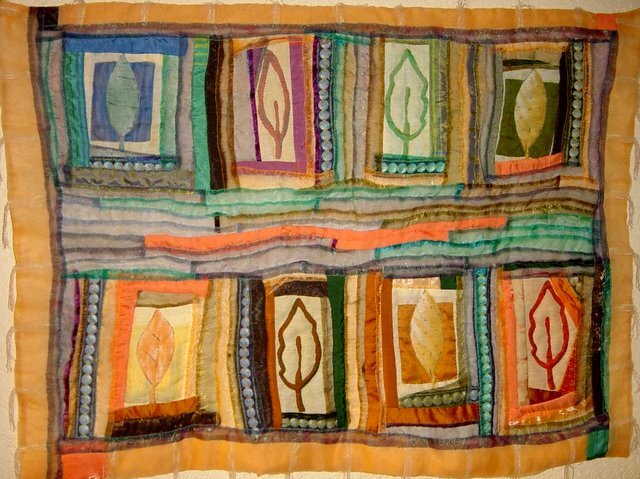 Thanks Sherri Lynn for having brought up these thoughts about one’s way of quilting and expressing it. 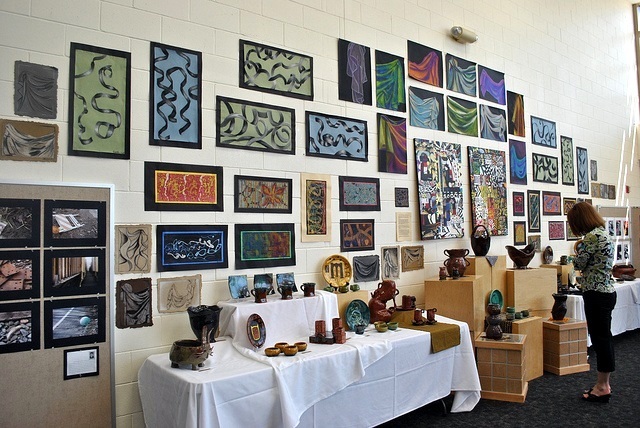 This is the Upper School Art Show of the Mounds Park Academy in Saint Paul, Minnesota. The show is open from May 17 to June 3, 2011. How do I know about it ? That is a real nice story. 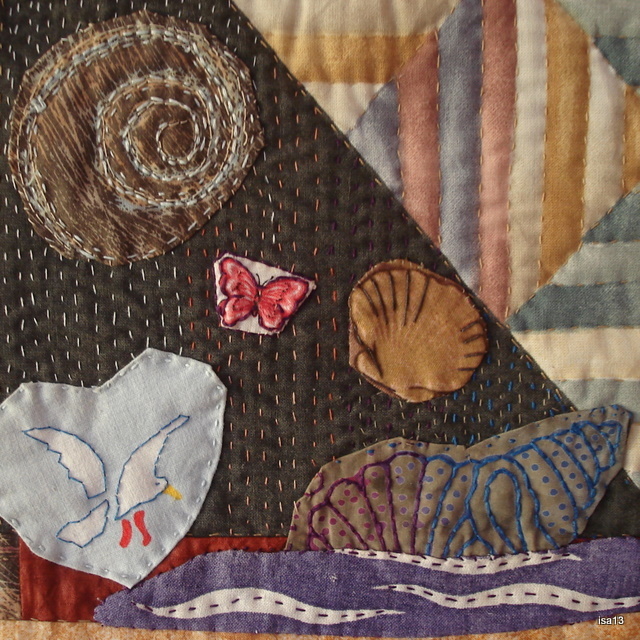 One that happened thanks to Internet, quilting, a painting class of 15 students between 15 and 18 and their dedicated art teacher, Renee Sonka, in the heart of the Midwest, Minnesota. 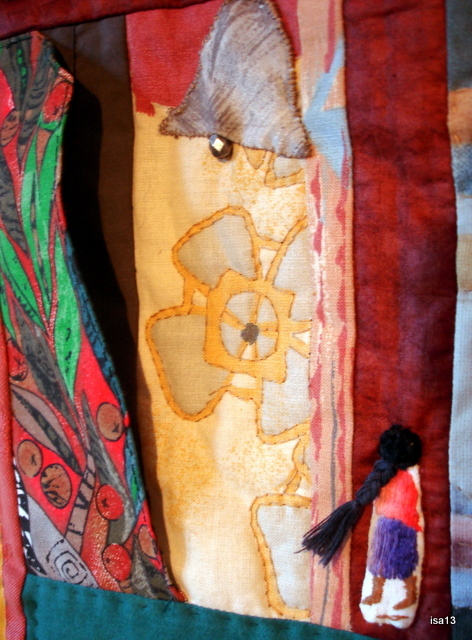 or how African fabrics are inspiring and travelling ! 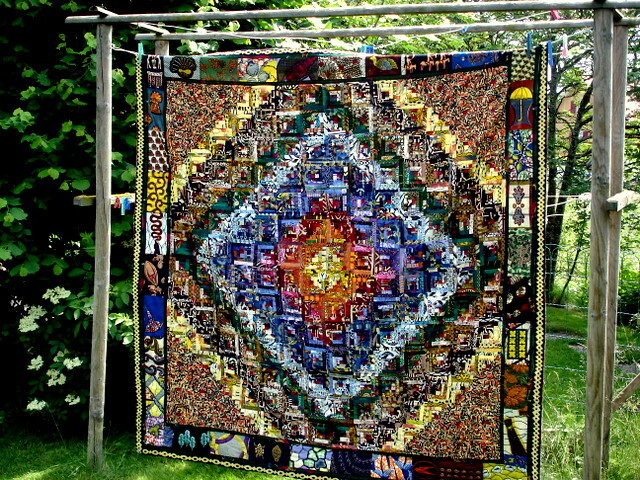 You may remember this quilt of mine, an African mosaic I posted on January 2009 as I started this blog. 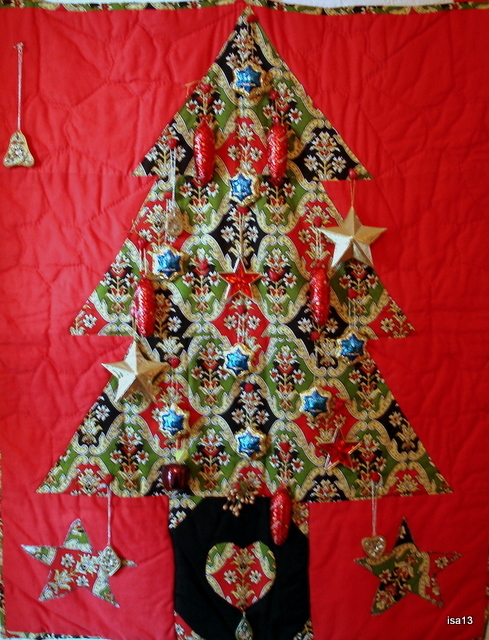 It is a logcabin pattern made with countless scraps of fabrics I brought back home after a stay in Africa with my family. The art teacher, R. Sonka, had a particular project in mind for her painting class. 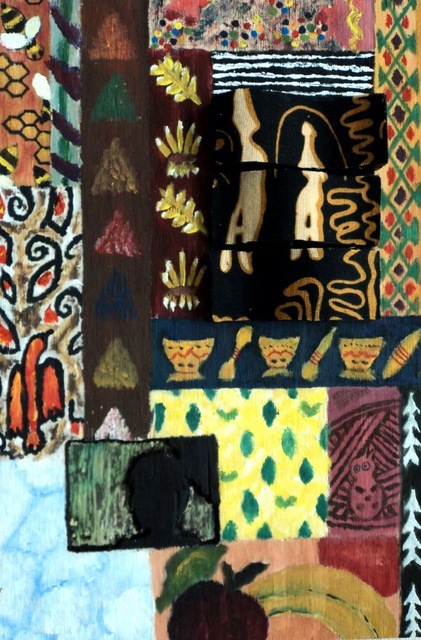 It was entitled : AFRICAN TEXTILES as inspiration for mixed media paintings. The designed plans were to study the textiles, infuse mixed media, think about subject and meaning, become the composer, develop sketches and realize one’s idea ! 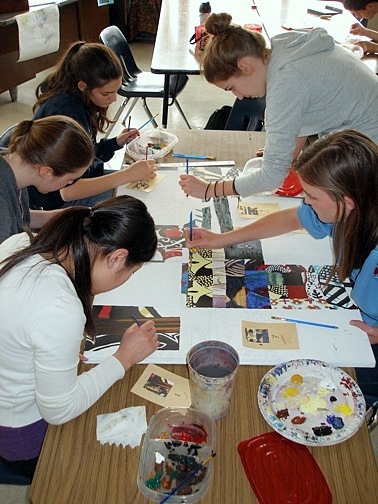 In addition the students were to create a larger collaborative painting where each of them would be responsible for small sections of the whole. 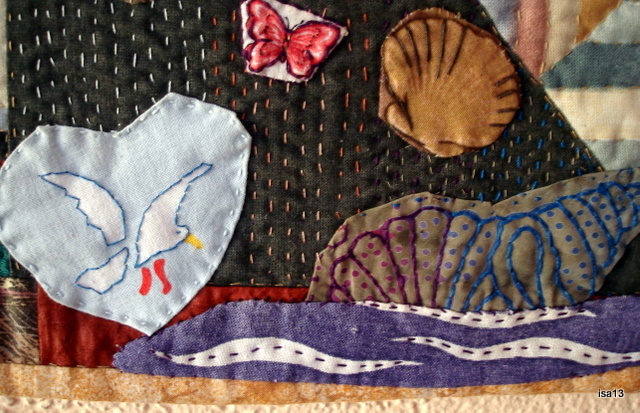 Together with the picture of the quilt, I had also posted a detail of it. 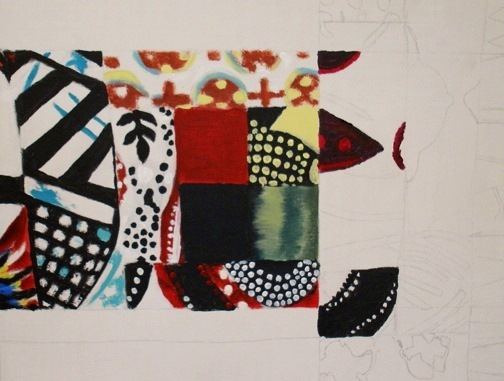 This is what the students chose to create painted versions of sections of my quilt. A few students are working on their individual compositions. Glimpse of a larger panel that students are working on collaboratively. 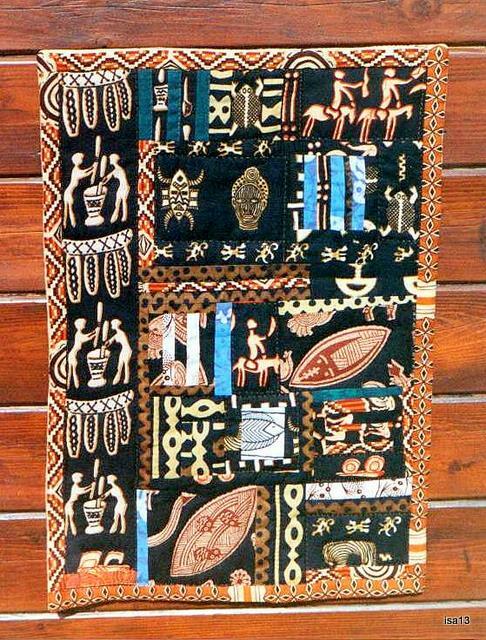 The quilt image has been divided up so that each one can contribute a section to the larger whole. 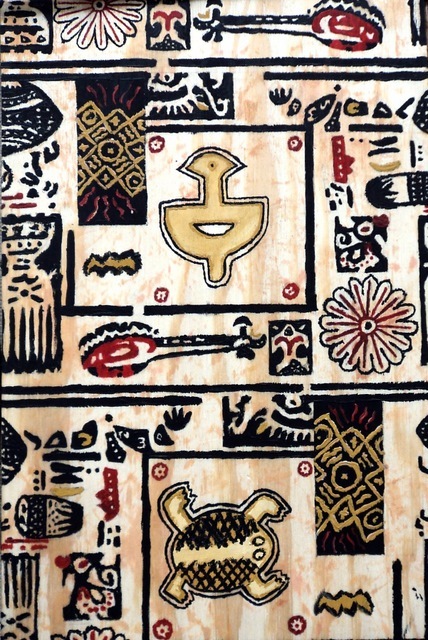 Drawing inspiration from patterns and colours in African textiles. 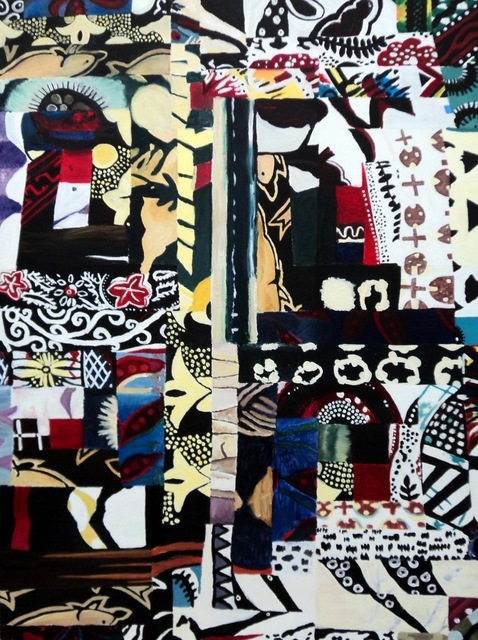 This is the collaborative painting of a section of my quilt ! I cannot express how honored, admirative and touched I am as I look at the work of those 15 talented students. They used acrylic paint on canvas. Never would I have imagined that my quilt could be such a source of inspiration. It is a beautiful project and you can all be very proud of all you achieved ! 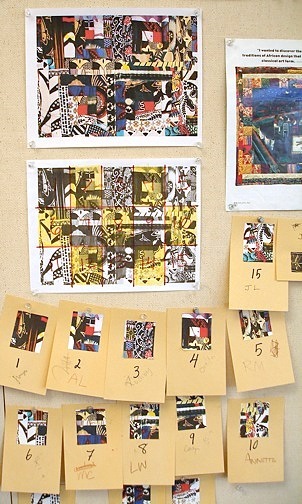 The other three pictures represent individual compositions designed by students. 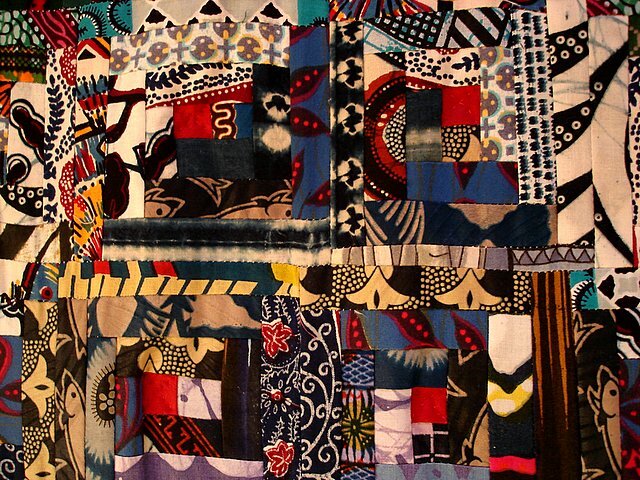 More inspiration from patterns, textures, colours found in African textiles. 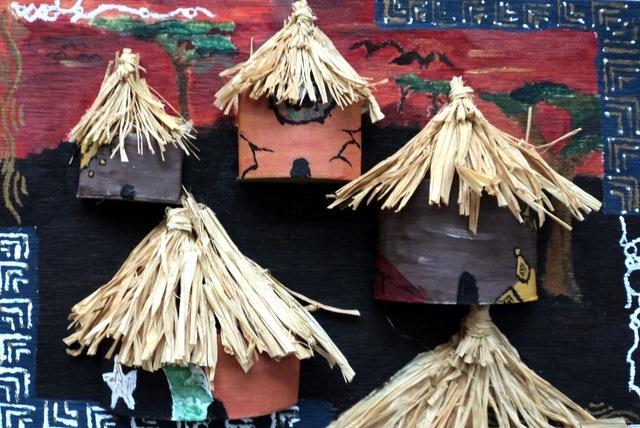 They used acrylic paint on plywood, some include other materials such as fabric, cardboard and raffia. The art teacher, R. Sonka, sent me all those pictures, for which I am very grateful and happy to share with you. Thank you Renee for all your mails and details; without them I would probably not have been able to explain well enough the development of this great project. 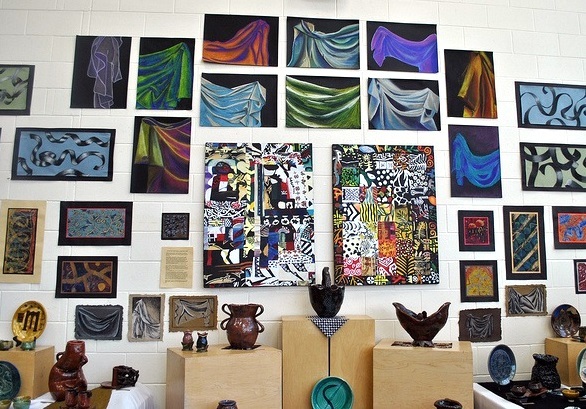 This is the school Art Show that represents the drawing, painting and ceramics classes. A beautiful compilation of weeks of work, individual and collaborative. I like this concept very much. Congratulations and much gratefulness to each and everyone who participated in this fantastic and creative project. 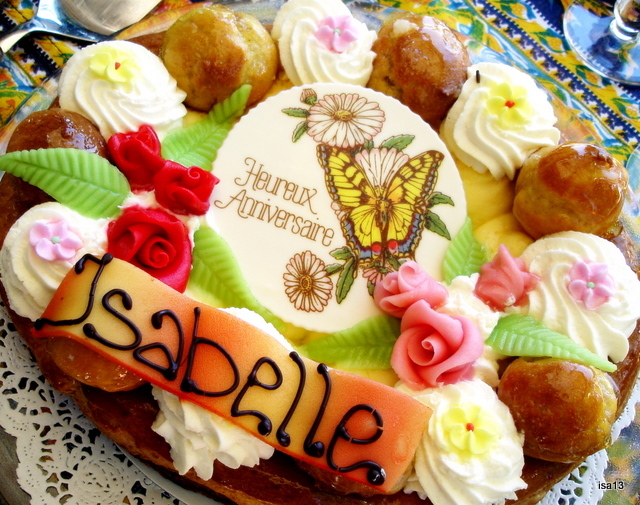 With many good wishes for the continuation of your teaching and studies. Here is a link about the Art Show and the Mounds Park Academy in Saint Paul/MN. Another step in my WIP-quilt (work in progress). 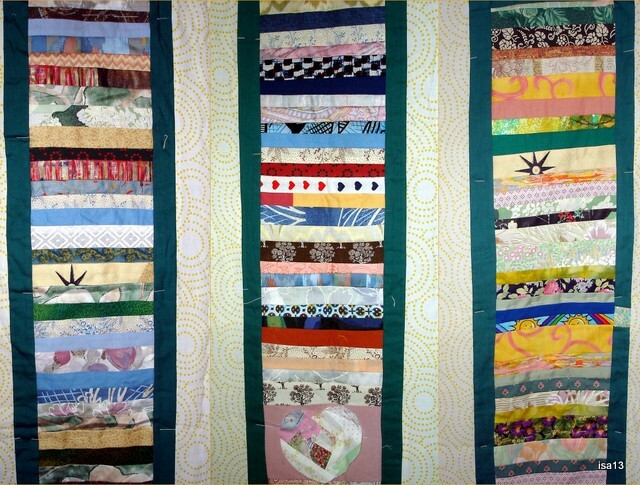 A passage quilt for a friend who passed one year ago. Little by little thoughts and memories come to mind and I add this or that piece to the vast puzzle of a life. “I am at the beach with my family. I must have been 10 years of age. A small and skinny boy. I loved to swim and I’m swimming out … far. In my mind, I am swimming out so far where nobody will ever find me. I have swum out so far that everybody on the beach looks like tiny specks. I get the feeling that sharks are swimming near me and I frantically swim back as fast as I can. Once back on the beach I’ve got to run along the coast to find my family. I see one of my brothers and am relieved. I see that he has a bologna sandwich in his hand and I run to the car to get one myself. Seagulls are flying above and I toss a piece of bread up to them. The seagulls flock around, waiting for more. I take a slice of bread when my mom is not watching because she has told me to leave the birds alone. I am fascinated by them and want to catch one but they get in flight too fast for me. I watch them fight for a piece of bread and, as one seagull drops it, a mad rush to the sand ensues. I wrap a shell in bread and toss it up so a seagull will drop it. I run to catch a seagull as they come down but they quickly see me coming and I watch as they take flight. The sun has tanned me good. I attempt to bury myself in the sand and I watch the seagulls soar above me”. Today we celebrate Mother’s Day in Switzerland. 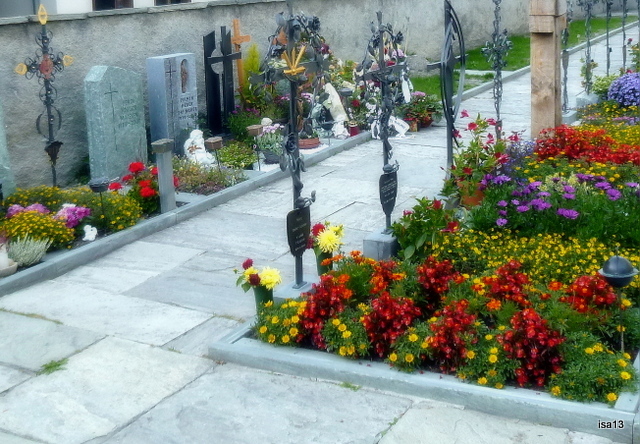 My own mother is no longer here but she will be lovingly remembered indeed. 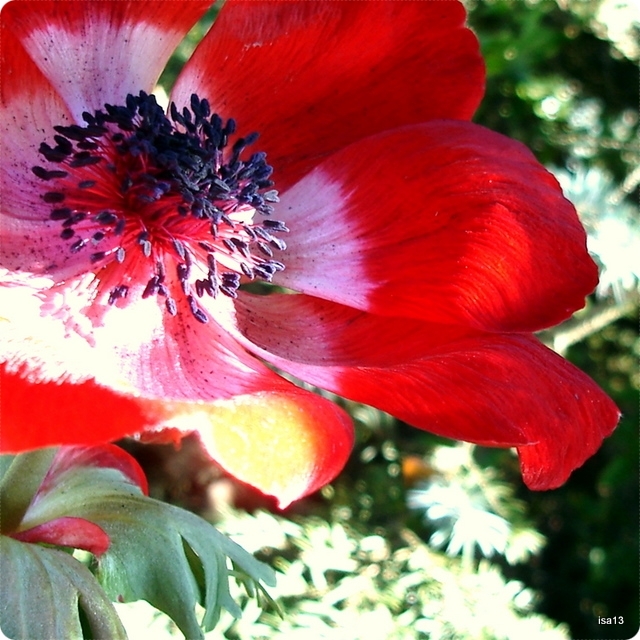 This flower is for her; her love of nature and flowers, her pleasure to sit in the garden, inhale scents and let her eyes wander quietly over the greenery. She sometimes started telling of her younger years in the mountains she loved so much, a life of hard work that taught her a lot about nature, its beauty and dangers. I am happy to have written down much of all she shared although her words are in my heart forever. The D-Day finally came and the suspense was relieved. Both would wait till I woke and then present their gifts, nicely wrapped in a paper they sometimes had created themselves. What an excitement and impatience for me to open those treasures ! I received many, many wonderful drawings and gifts of all sorts, made with love and care; I cherished them all. 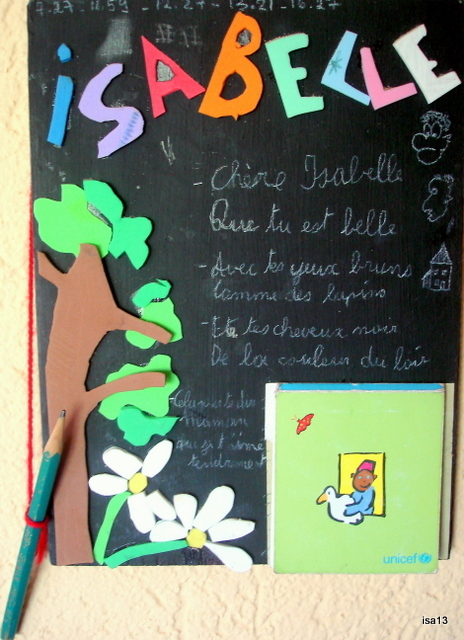 One of them is still in our kitchen : it is a small decorative wooden panel made for me in primary school. There was an original handmade notebook on the right hand side that has been replaced countless times since then. Very handy. What still brings a smile whenever I write a note on my “to do list” is the poem one of my sons had composed for Mother’s Day on that particular year. To all mothers, mamans, mamas here and there and elsewhere I wish a Very Happy Day filled with love, sharing, joy and gratitude. 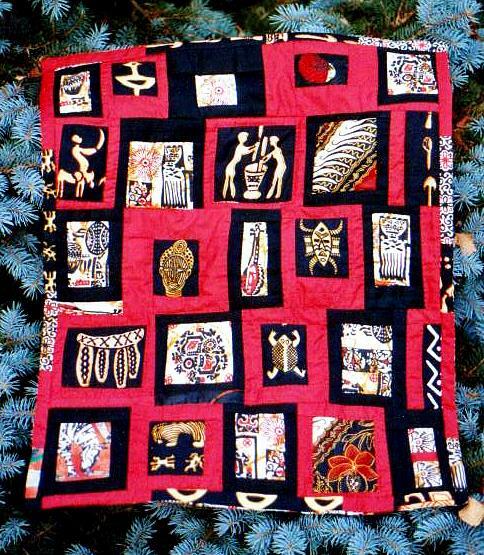 This is quilt I sewed several years ago for a Mexican mama of many children who happens to be also a dear friend of mine, Fina. No, Summer has not come yet in Switzerland 😉 far from it ! These pictures were taken last Spring when I almost finished the top of a quilt started one year earlier, in January 2009. 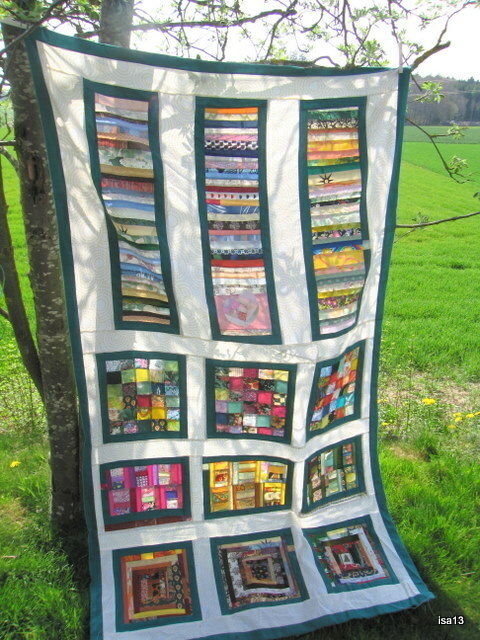 It is a calendar quilt. 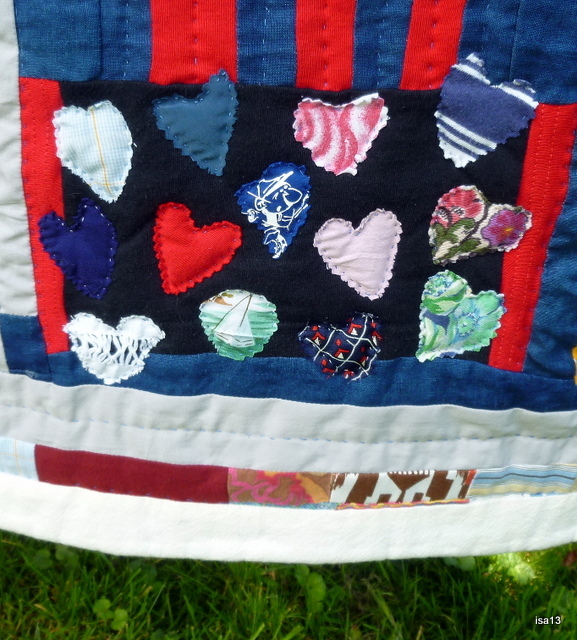 Each month I sewed together 30 or 31 pieces of different materials – scraps from other quilts – according to the Season or to a particular day : a heart for Valentine’s Day in February, roses for June or a bare trees pattern for November, for instance. The months being all sewed, I still had quite a few scraps left. Scraps of scraps… Beautiful ones too. So, what to do ? 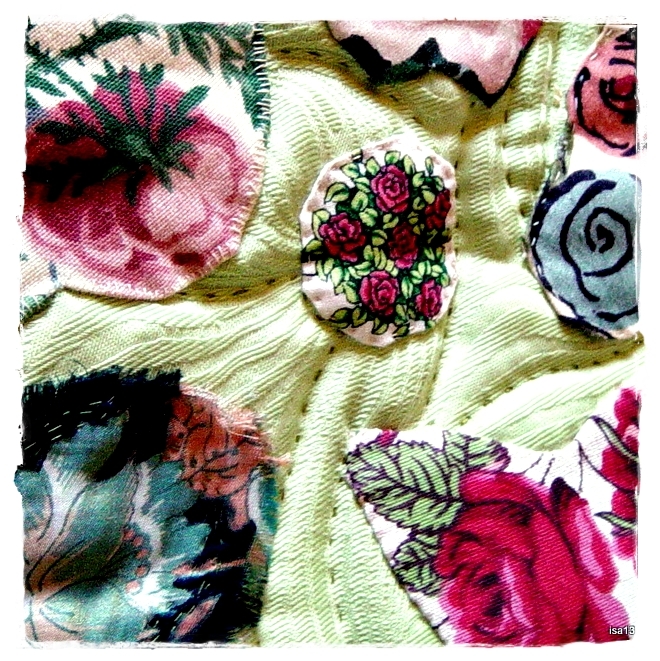 Thankfully was inspired by another quilter’s work and decided to sew together all those real small left-over pieces. It was quite an adventure, one which created an incredible amount of threads and tiny fabric confetti that spread (I spread involuntarily) all over the house. Which reminds me… I must bring you some day to an interesting museum in my town : The Gutenberg Museum. 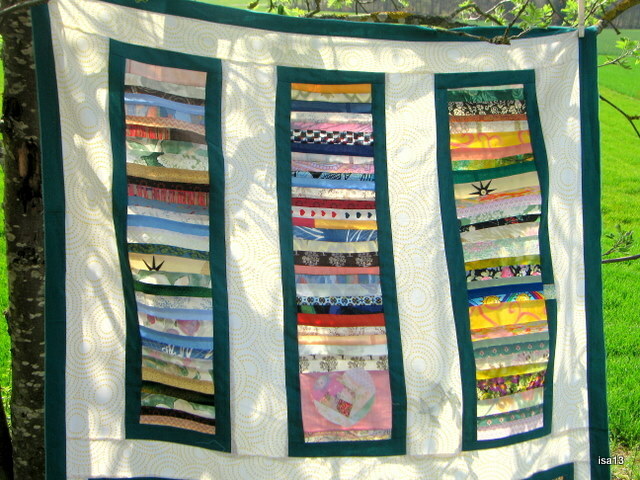 Now, to go back to the calendar quilt, my idea was to border it with more beautiful scraps. Which I did. 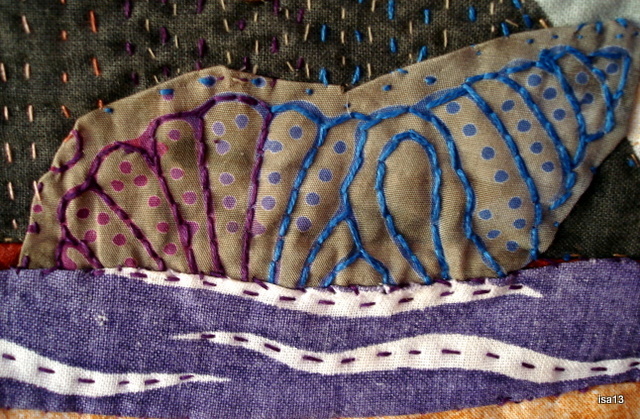 Underneath are a few examples of these borders before I added them to the quilt. And here is the end result, a quilt of about 1m50 x 2m20. 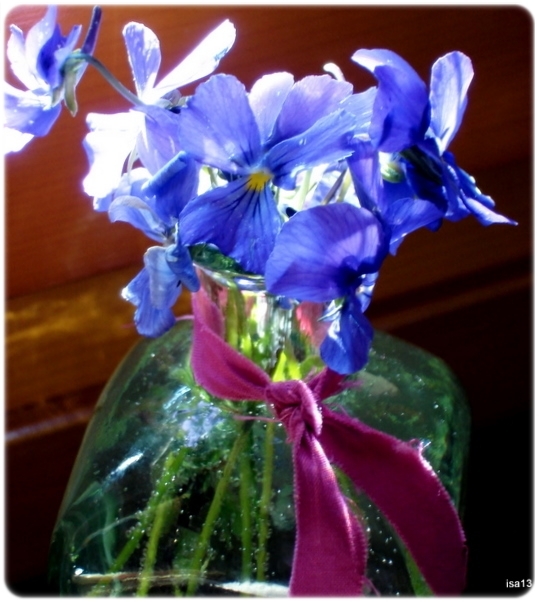 I am very happy to have given a sort of “second life” to my scraps . I feel like using more of them in the future and I certainly will. 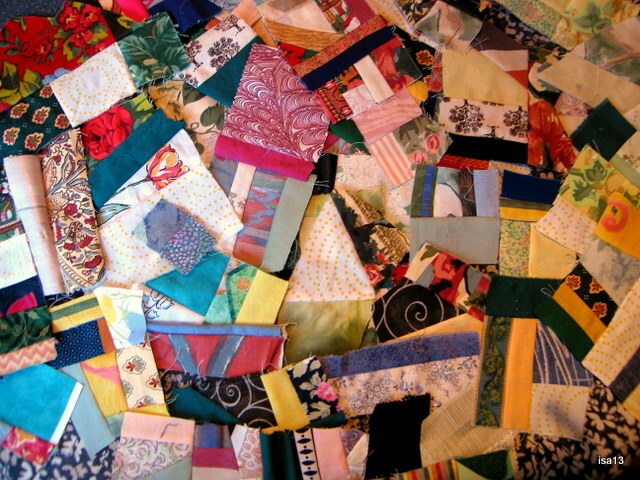 Many colourful scraps are waiting in various ancient tin boxes to be part of another quilt. Quilting and embroidering the names of the months still need to be made but this is probably my favourite part and I look forward to this. 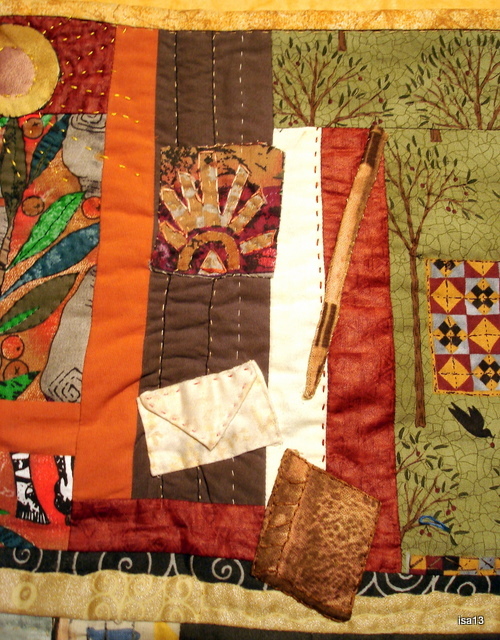 A very relaxing work where thoughts and stitches meander along the quilt. another picture in close-up of the three months, January, February, March. Stars in your eyes and in your heart. 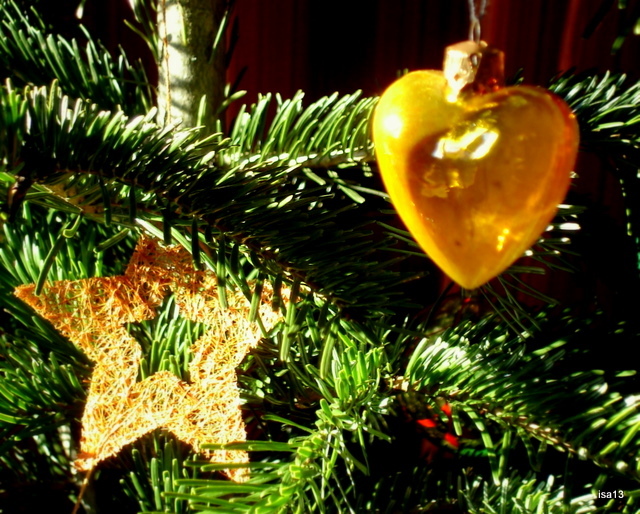 May this happy time of Christmas bring you the joy of spending precious moments with those dear to your heart. Happiness also for sharing a smile with someone you don’t know. May the light of Christmas shine in your heart long after this celebration. Merry Christmas and a Very Happy New Year to you and yours ! 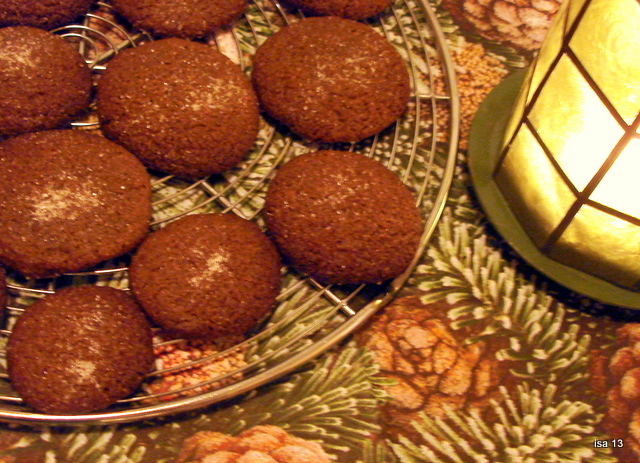 Just enough time to bake a few more cookies… Those I love : with spices and molasses. Here is the recipe of these delicious cookies as shared by Cindy, thanks a lot Cin ! Merry Christmas to you and yours ! ¾ cup butter and 1 cup sugar, beaten until fluffy. 2 cups flour, ½ tsp salt, 2 tsp cinnamon, 1 tsp ground cloves, 1 tsp ground ginger, 1 large egg, ¼ cup molasses, 1 tsp baking powder. You’re left with a soft dough, refrigerate for an hour until firm and workable, then form into small balls and coat with sugar. Set on a baking tray an inch apart and bake at 180C for 10 minutes. The biscuits will harden on cooling. 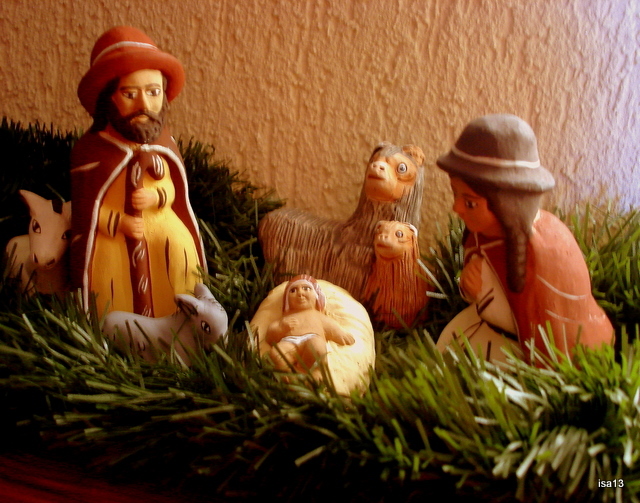 In praise of the sleeping child. It is Summertime, the sun is blazing over the small Southern town. Three boys are running out in the streets, turning the water hose on and playing in the water. Their grandmother smiles as she is watching over the three brothers full of enthusiasm and energy. 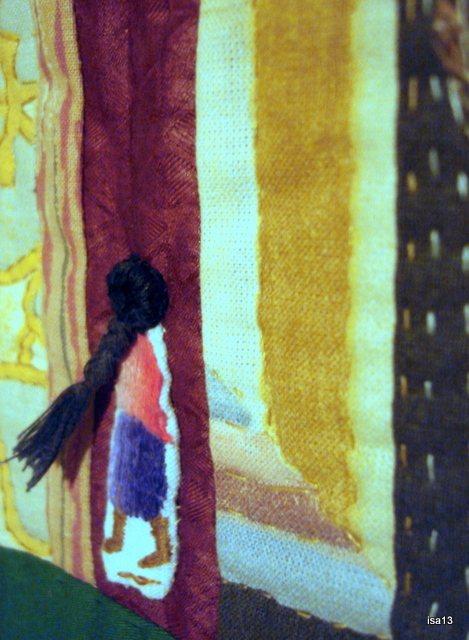 Her black hair is combed in a long braid on her back as Mexican women do sometimes. Often she thinks that the boys stay outside too much but how can she keep them inside a two-bedroom home ? The old woman has trouble walking and when the boys ignore her demands, she tries to grab them around the neck with her cane ! So one day when the youngest boy was still playing at the elementary school playground, he heard the church bell ringing out. He dropped everything and ran home as fast as his small legs could carry him. He spotted some bushes and as he thought the devil would see him running, he hid behind them until the bells quit ringing. Soon he poked his head out and not seeing the devil about, he ran all the way home dancing happily and raising his little fist as he arrived safely. A happy moment in a kid’s life. A child like any other. A dear friend’s childhood memories shared in a letter and sewed in my own way.